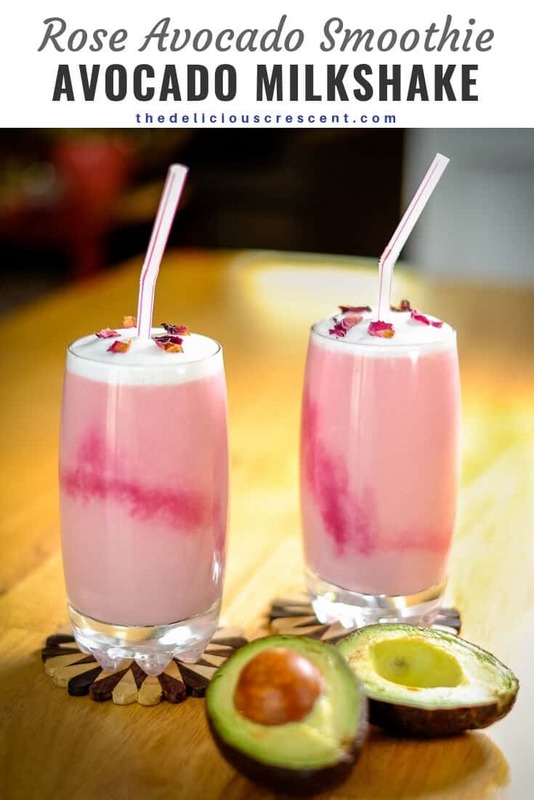 Rose Avocado Smoothie is a Moroccan style beverage. It is so creamy, fragrant, delicious and heart healthy. And it is a good source of monounsaturated fats, potassium and protein. When I visited Morocco, I came across a popular beverage known as Jus d’avocat (juice of avocado in French). 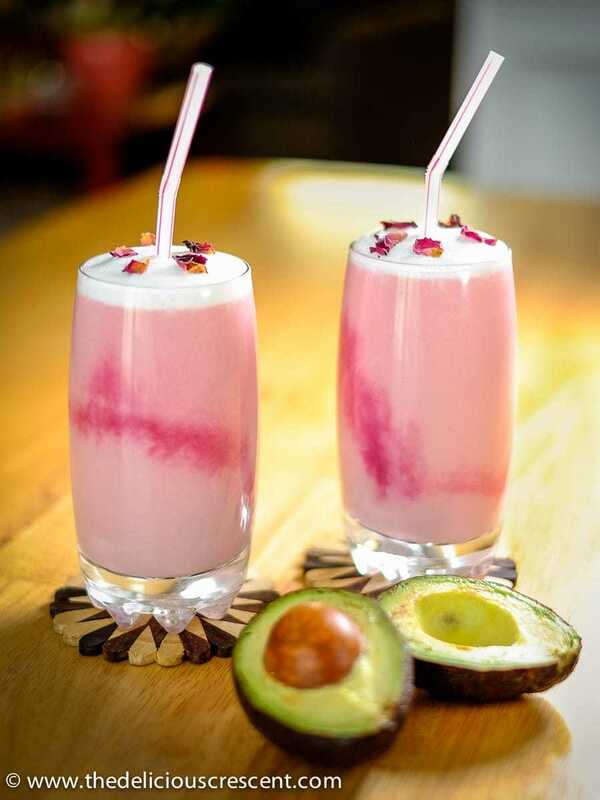 A no-frills simple drink made with only sweet milk and avocado. Now that reminds me of another middle eastern beverage – Sahlab (a healthy orange blossom drink). So, once I came back home, I wanted to try making what I had in Morocco. But I wanted to give it my own twist. Ah! then I remembered my favorite rose flavored drink. In my childhood there was a treat that I looked forward to all week. Every Saturday at mid-day my father would pick us up from school and take us on his motor bike to get me my treat – Rose flavored beverage!! How much I loved it! It was sweet, rich and creamy. The addition of avocado gives a nice nutritional boost, which contributes to good health as it is rich in monounsaturated fats and vitamin K. It provides beneficial plant sterols, phytochemicals, fiber and some vitamins. I discuss in greater detail about this wonder fruit in my post about a creamy leeks avocado cilantro soup. For this recipe I have used beet juice to add the rose like color to the smoothie. Some research studies have shown that beet juice may help one exercise longer by boosting the stamina; improves blood flow and helps lower blood pressure. Beet juice is a rich source of antioxidants and naturally occurring nitrates, which convert to nitric oxide in the body, eventually helping with blood flow and blood pressure. Beets are also a good source of potassium and folic acid. Make sure to choose ripe and fresh avocado, that yields to gentle pressure. When cut open the avocado flesh should be a nice green and not mushy or brown. You could use whole milk to make this beverage. But the avocado makes the smoothie quite creamy so I prefer to use reduced fat milk. Do checkout the notes section below for the beet juice preparation. Many smoothie recipes use sugar based syrups, artificial colors and flavors. You don’t need any of that here. Using natural and whole food ingredients you can make an amazingly rich smoothie! Another rose flavored beverage you could make is with my Homemade tea blend using rose, citrus, apple and berries. Slice the avocado lengthwise. Remove the pit and scoop out the flesh. Add the milk, beet juice, rose water, honey and ice cubes and blend it at a high speed. I used a Vitamix, but any high speed blender should do. Adjust the amount of milk to give it a smooth pouring consistency. Adjust honey to taste. Top it with some cold milk foam and rose petals. Serve chilled. Thank you Claire. So happy you like it. Yes, the avocado does work so well in this. I love how you added beets to this, as it did give a very lovely colour! Rose water milkshake sounds really interesting. Thanks Diana. So glad you liked it. 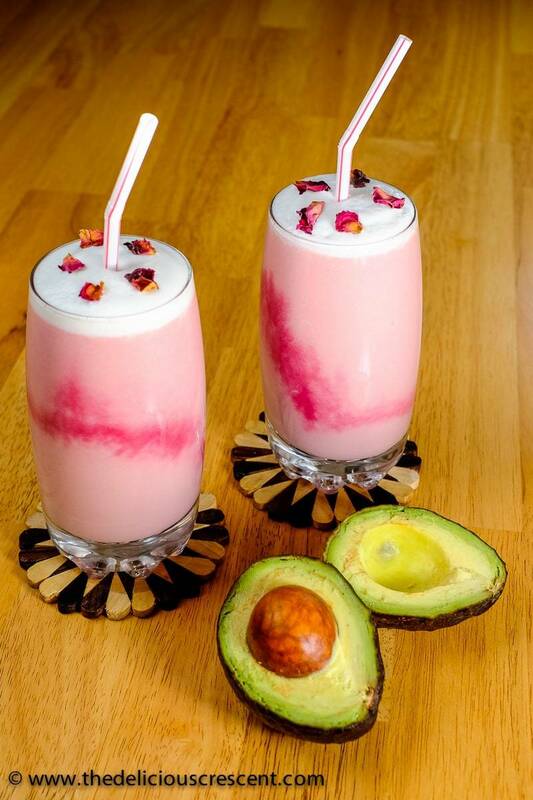 That’s so refreshing and yummy!Plus love that is there Avocado in this. Thanks Prasanna. The avocado really works so well in this recipe. You should really give it a try. Lots of other possibilities too.